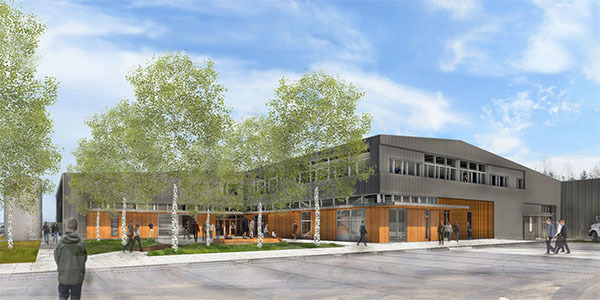 Rendering of the completed South Operations Center. In 2017, Seattle Public Utilities (SPU) purchased property at 4500 W Marginal Way SW for use as a new Drainage and Wastewater South Operations Center (SOC). Construction permits have now been issued by the Seattle Department of Construction and Inpections to construct four new buildings (warehousing and vehicle wash). Outdoor storage is also proposed. The existing building will be remodeled and a garage will be demolished. Surface parking for 112 vehicles will be provided. SPU said its current facilities are no longer adequate to house essential field crews, vehicles, and equipment that clean and repair the City’s sewer and drainage systems, investigate waterway pollution, provide emergency response to storm events and natural disasters, and more. The new facility will allow SPU to continue providing efficient and equitable utility services for residents in West and South Seattle. SPU has spoken to nearby neighbors and community groups to build awareness of the new facility and ensure we are being responsive to community needs and expectations. In partnership with the Office of Arts and Culture and representatives from the community, the Seattle Arts Commission has selected an artist to develop a vision for permanent public art to be displayed on-site. In partnership with Pathfinder K-8 School, SPU has commissioned a student art project to develop temporary art that will be displayedon the site’s outer fence throughout construction. SPU has begun using the site for interim operational activities, such as vehicle and materials storage to enable crews to coordinate operation of multiple SPU programs from one location.